Our Curbside Drop service is $100 for any safe and it applies to our Southern California customers only. Longer distances will increase the cost accordingly. This is done by our own professional West Coast Safes installation crews in unmarked trucks. This service does not include unpacking, setting up, or installing your safe. Our In Home/Garage/Business Ground Floor Installation service applies to our Southern California customers only. It starts at $200 and increases based on the size and weight of your safe. This is done by our own professional West Coast Safes installation crews in unmarked trucks. Our service includes bringing the safe inside while protecting your flooring and thresholds as needed, unpacking it, getting the safe into its final position, shimming it level, anchoring it to the floor (if possible/wanted), setting up the interior, and teaching you how to use it. For installations involving more than 4 steps, our Upstairs Installation rates will apply. West Coast Safes has been selling, delivering and installing safes and gun safes in Southern California since 1990. Through the years we have installed tens of thousands of safes all over Southern California from our showroom and warehouse in the city of Ontario, California. 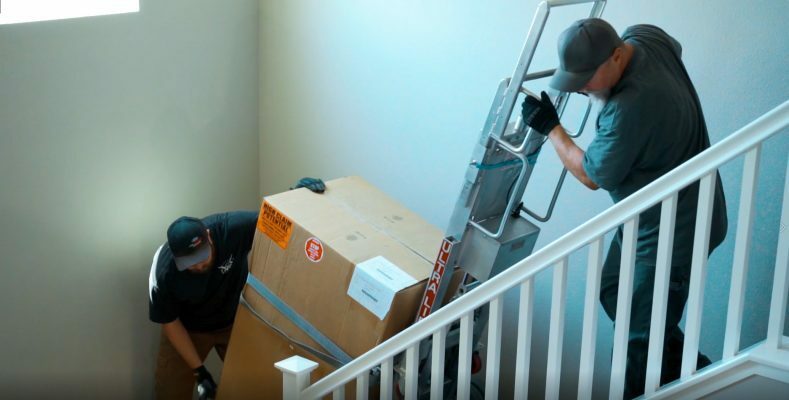 We have our own unmarked trucks and highly trained delivery and installation professionals that deliver, install, level and bolt down safes in Los Angeles County, San Bernardino County, Riverside County, Orange County, San Diego County and also Ventura, Santa Barbara and Imperial Counties. In Southern California you can never live too far for us to not be able to service your safe and gun safe needs. West Coast Safes sells more safes in a single month than most lock and safe dealers sell in a whole year and because of this high volume our prices for safes and delivery/installation are usually hundreds less than the safe dealer right down the street.